Friday 23 August 2019, 7.15 - 9.45 pm. Experience a True History tour. 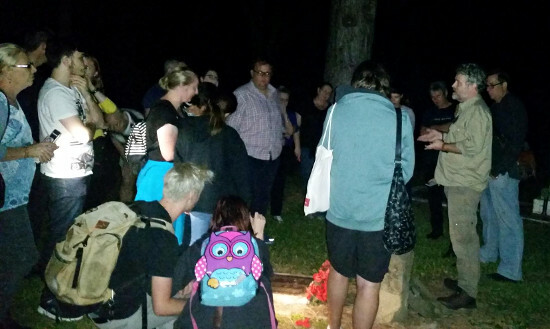 Take a night-time stroll on the artistic side through this beautiful and historic cemetery. Visit the graves of the poets, musicians, painters, writers and sculptors who lie within there, and hear their stories. Our guides are happy to chat with you and take your questions during the tour. Please note: This is a 'real history' tour of the cemetery and will not mention anything about 'ghosts'. 2 - 2.5 hours, from 7.15 pm (tour times can vary depending on levels of customer interaction during the tour). 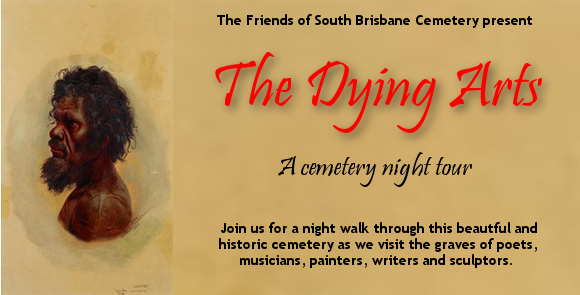 These tours are not-for-profit and run by the Friends of South Brisbane Cemetery (Inc.) in partnership with the Boggo Road Gaol Historical Society (Inc.). Tours are conducted under license from the Brisbane City Council. Profits go towards our cemetery heritage projects and FOSBC community activities.